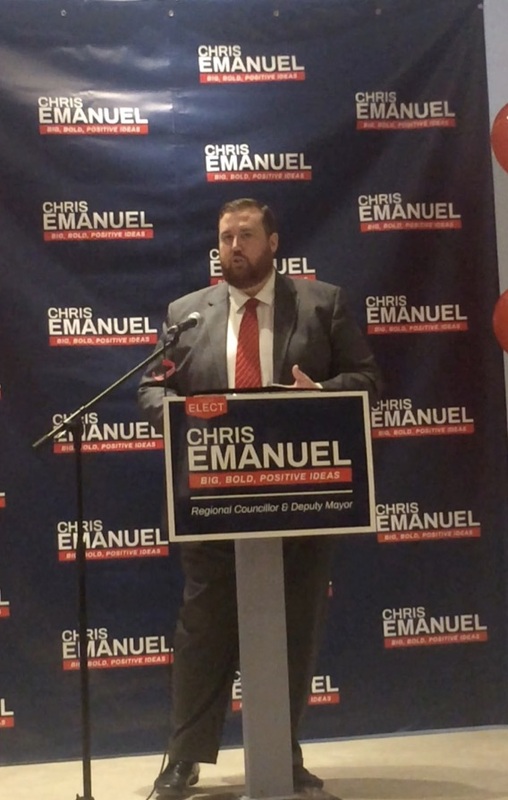 Regional Council candidate Chris Emanuel today slapped down Tom Vegh for promising a new library and seniors’ centre when for the past four years - as a library board member – he failed to move the agenda forward and get anything done. Emanuel paints a picture of Vegh as all talk and no action. Someone who was unable to show us what his new library would look like and what it would cost. Over the years I’ve sat in on a number of presentations to Council by Library Chief Executive Todd Kyle and I don’t recall Vegh banging the table, demanding a new library. Had he done so I think I would have remembered. 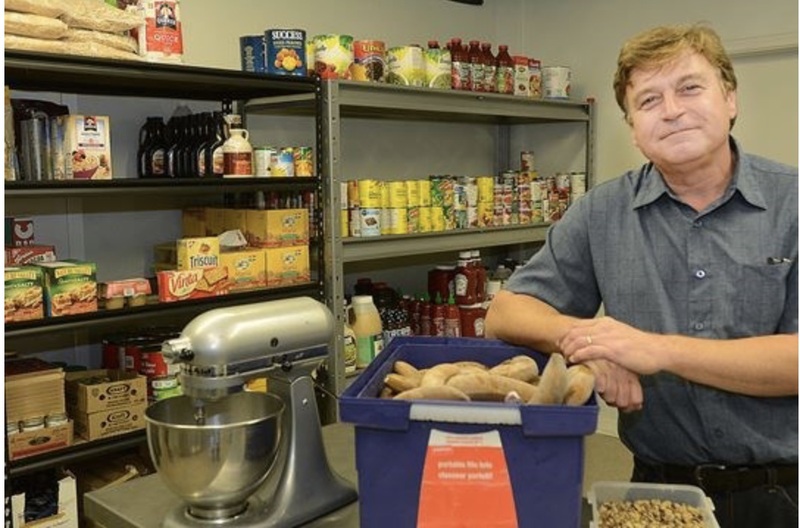 “One of the drivers for not opening 7 days a week has been the cost.... I can't imagine not moving forward on a 7th day because of cost, but he's now able to justify a new facility... how many days will it open? In a Tweet last week (8 October 2018) Vegh says the combined Library/Seniors’ Centre would be located on Paterson Street on the Hollingsworth Arena site. Vegh says he wouldn’t sell the site to developers. However, in 2015 Vegh was in favour of doing a deal with the swashbuckling pseudo developer Sandro Sementilli to redevelop the site (but not for a library). His Progressive Conservative colleague on Council – Jane Twinney – voted against. The deal fell through. 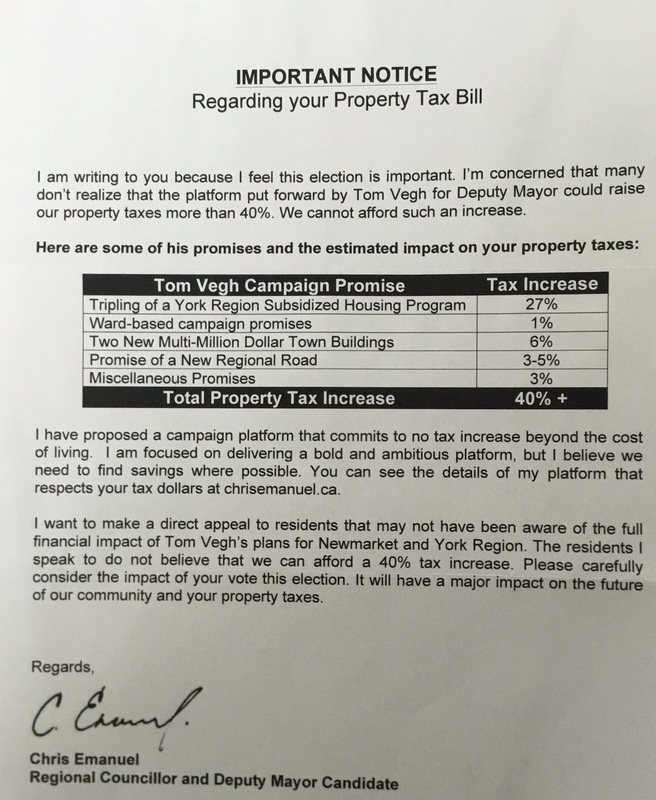 A letter from Emanuel now going out Town-wide repeats his earlier claim that Vegh is promising two new multi-million dollar Town buildings. “A new community centre in Copper Hills is not in my platform nor in any of my campaign literature. Neither the Town or I are entertaining such an idea. If Vegh delivers a community centre people won’t care who paid for it. They will remember he pushed for it. Emanuel accuses Vegh of having a shopping list without prices. 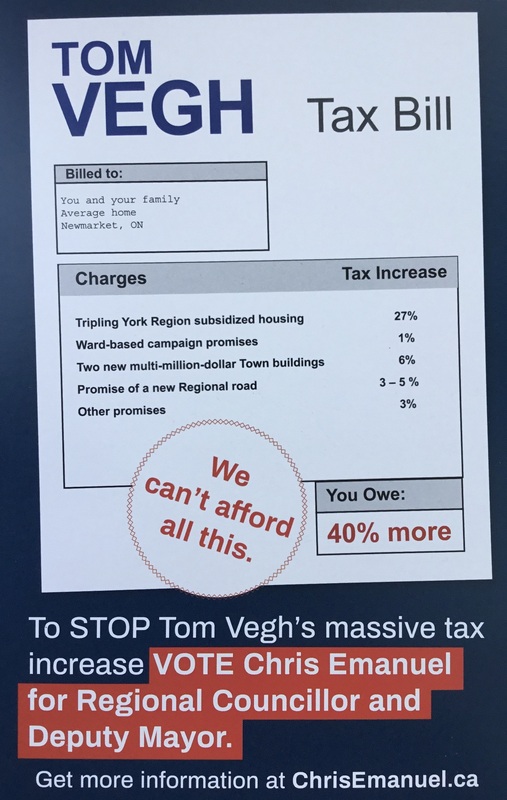 Emanuel says Vegh expects developers to pay for his (Vegh’s) promises through Development Charges. 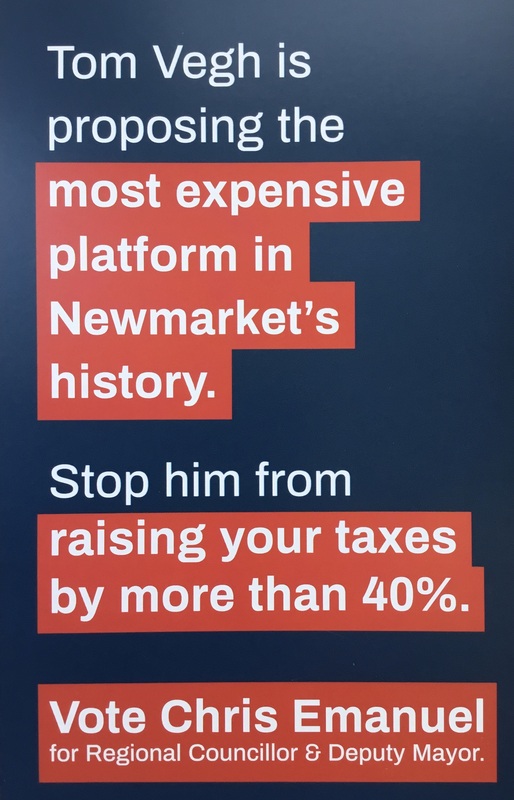 (This is money paid over to York Region and the Town of Newmarket ostensibly to offset the additional costs of growth – the sewers and roads and so on.) But Emanuel insists this won’t happen as developers are already paying the maximum allowable (90%) as set out in Provincial legislation. I don't know if that is true but Emanuel says it with such conviction I am prepared to give him the benefit of the doubt. Emanuel says it is unrealistic to expect spending on housing in Newmarket to be tripled without a similar percentage increase across York Region – and that would cost a stack of money – approaching $1 billion in operating and capital costs. According to Emanuel, the assumed 40% hike in property taxes includes 3%-5% for a new regional road. Emanuel says Vegh has a load of other promises including a new tennis facility and a parking structure downtown. All uncosted. Emanuel says his accounting of the 40% tax hike is a conservative estimate but concedes not everything Vegh is promising is likely to happen. 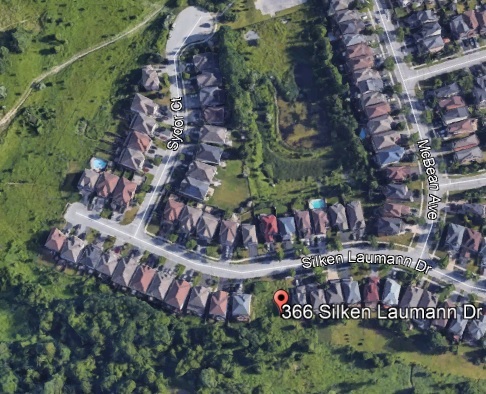 In 2005 Tom Vegh bought land from the Town at Silken Laumann Drive with the aim of developing it. For various reasons this proved to be impossible and the Town bought the land back from Vegh in 2009. The central question for me is this: Did Vegh get special treatment? Would any other member of the public in similar circumstances be treated in exactly the same way? 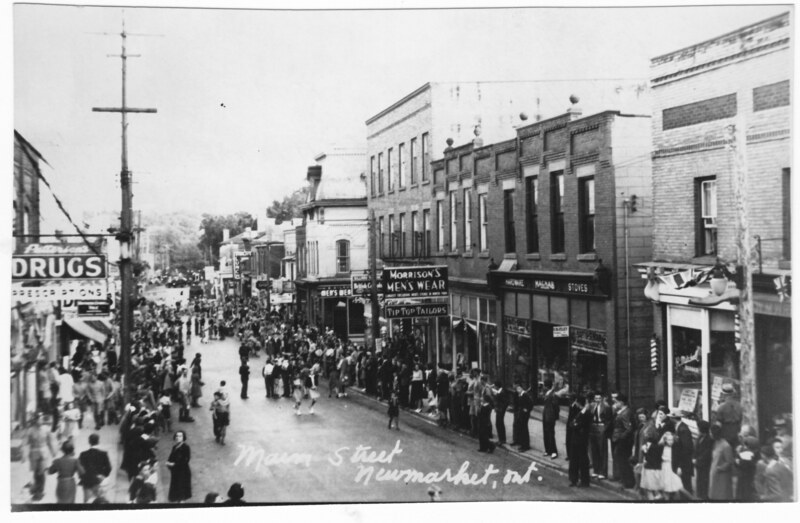 Vegh has been a member of Newmarket Council since 2000. He stresses he was not on the Council in 2005 when the deal was done. We are talking here about a land transaction between an individual and a public body where the details should be publicly available. This information should not be off-limits. I addressed this on Newmarket Votes on October 4th, but you must have missed it. Here is what I posted. Please correct your story. • In 2005, when I was not on Council, through a blind bidding process managed by a third party, my wife and I were the highest bidders to purchase a residential building lot that the Town declared surplus and advertised in the Era Banner. With the sealed bid was included a mandatory $40,000 deposit. Our goal was to build our dream home. • We were aware that the Town had an easement over a portion of the property and we had no problem with that because it was not in the allowable building foot print. • During the due diligence process our engineer discovered that there was an unprotected large storm pipe 40 feet deep under the easement that would require us to build foundations 40 feet deep to protect the pipe, at an additional building cost of $225,000. 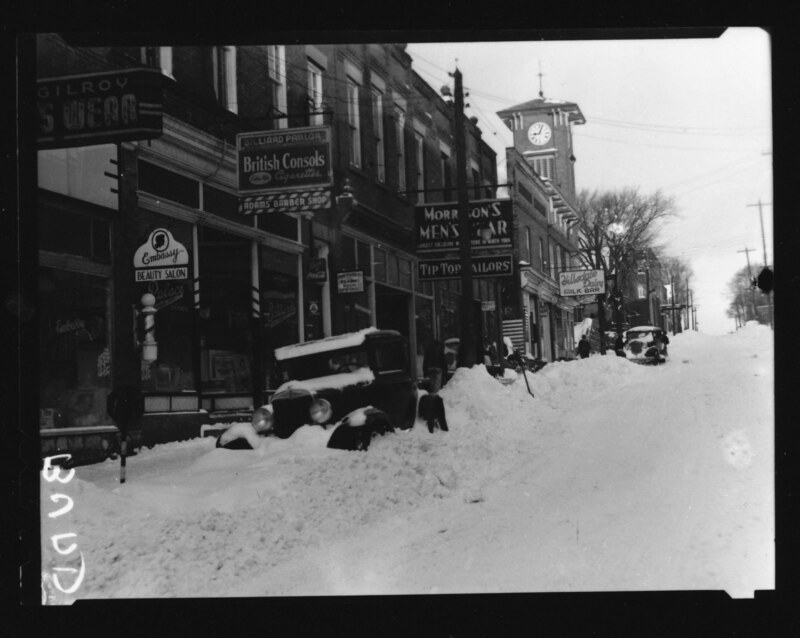 • The Town admitted that they were not aware that the pipe was not in a sleeve (protected) and agreed that the need for an extraordinary building foundation ($225,000+) should have been disclosed in the original sales listing. • It was settled through a mediated court process, not at council. Council only approved the Minutes of Settlement. The Minutes of Settlement was dictated by the mediator (a sitting trial judge) and rested on the agreed statement of facts. It was short and made three orders. 3. each side was responsible for their own legal and professional fees. • The lot is only 40 feet wide and a little over 100 feet deep. There was never an application to turn it into a townhouse development. • The lot was listed with residential zoning in place. We did not apply for a zoning change. • The town did not pay our legal or professional fees. That is a claim made by others, but they admit they have no evidence to back it up. The $40,000 we received was the return of our deposit, without interest. 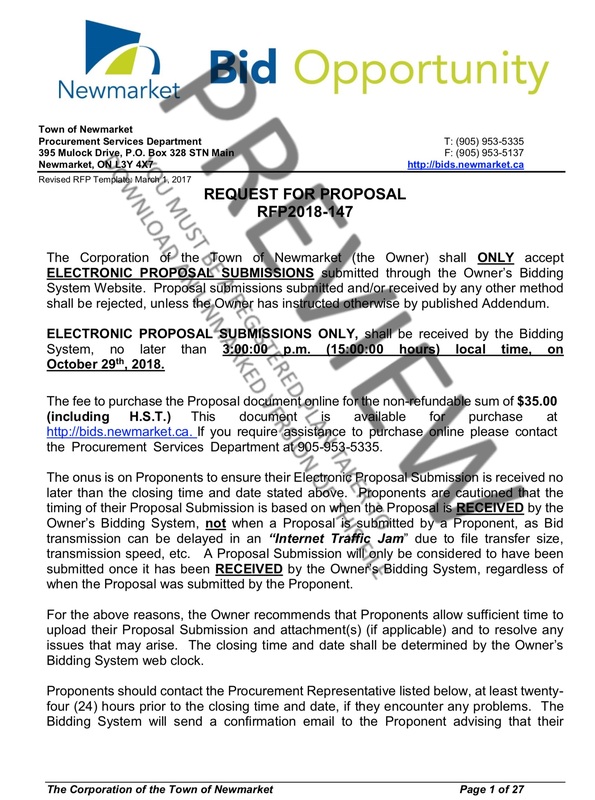 The Town’s Sale of Land policy – which tells me is updated every three years – is silent on reacquisition. Clearly this is something that is not anticipated. By keeping details of the reacquisition of the Vegh property under wraps the Town is being neither transparent not accountable. The way to resolve this is for Vegh formally to request the Town to publish full details of the land sale and the subsequent buy-back and to release it from any confidentiality agreement that may apply. Weeks before the election the Town of Newmarket is seeking the help of outside consultants to help set “strategic priorities” for the new Council term. The Town’s retiring Chief Administrative Officer, Bob Shelton, on a lip-smacking salary of $251,343, apparently needs the help of outsiders to understand what our elected officials are really thinking. Off-the-cuff comments by newly elected councillors – harvested on a bus tour around the Town - are to be taken down by staff and handed to the consultants who will interpret their true meaning. Why are we spending “taxpayers’ dollars” on this absurdity? Who authorised this? Shelton? Van Trappist? Elected officials? What is the contract worth? We should be told. And regardless of the dollar value it is the most unbelievable extravagance imaginable. If our own senior staff can’t do this work in-house they should be replaced by those who can.